I had big plans for this past weekend. B was going to be out of town and since it was going to be our first weekend apart in more than a year, I had a big to do list. 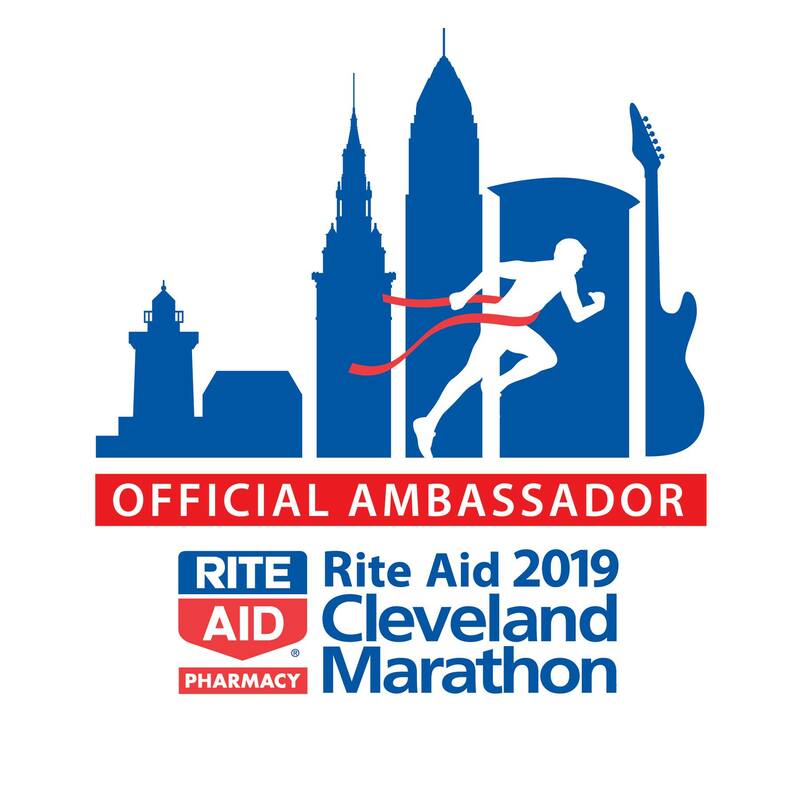 Lay on the couch, catch up on the DVR, perhaps run the Cleveland 10 Miler (I had done 9 no problem last week), sleep late, eat some Easter candy, bake, read on my porch, go shopping, clean the bathroom and maybe grab drinks with friends. See? BIG plans for when B was rocking out at his post-wedding bachelor party for Mitch (who got married last year). SO when B messaged me on Tuesday that he had seen a great flight deal to New York and asked if I wanted to plan a last minute trip to see my parents, I realized it was a no brainer. I had been missing my family for some time and I’d still get to sleep in, wouldn’t have to clean the bathroom, and as my brother reminded me, I’d get to enjoy some home cooked meals. AND with the weather due for sunny and 60s both days, I would definitely be able to get in a little running. Friday night after work, my friend Samantha and I headed to Porcelli’s for Happy Hour. My Downtown Cleveland Alliance City Advocates group was hosting a Guest Bartending Event, with tips going to the DCA Ambassadors (you know, those amazing men and women that clean our streets, walk you to your car at night, give you directions, say hi to you when you’re running and ever offer you umbrellas when it’s raining and you’re working to work). It was a good event and I’m glad my fellow City Advocates put it on – I don’t know how much we raised but Porcelli’s was more crowded than I’d ever seen it (confession – I’ve only ever gone there for lunch, not for drinks on a Friday night). Plus, Samantha and I got to meet a few new people that we probably wouldn’t have met otherwise. Drinks = Tips for DCA Safety Ambassadors! Saturday morning, I woke up EARLY (4:45 a.m. … which is still later than I woke up Monday morning, ick!) to get in quick run before heading out on an early flight to NY. I’m still trying to make sure that I make my 1,000 mi in 2013 goal (I’m almost halfway there! ), so every little run counts. Yes, I’m crazy for choosing to wake up before 5 am to run .. but at least I know I’m crazy. As soon as I got into NY, my parents picked me up at the airport and before I even unpacked or brought my bag upstairs, we went for a walk. When the weather’s nice (which it was – sunny and 60s both days! ), my parents go for longish walks on the weekend, and they asked if I wanted to come with them – of course! Their 6 mile Saturday morning walking route is nice – through some neighborhoods and a park. There was even a dog-friendly Relay For Life going on in the park, called Bark for Life , so we saw tons of people with their dogs. After our walk, it was time to walk Queenie. She’s another reason I love coming home. LOOK at that face! How can you be stressed out when you’re hanging out with her? Then it was lunchtime. My mom made an awesome veggie soup with zucchini, potatoes, tomatoes, carrots and celery that we all enjoyed. I also got to have some leftover homemade pizza. For dessert, we had some of the caramel, peanut butter, chocolate oatmeal cookie bars that I had snuck on the plane (shh!). After lunch, my dad put me to work. He had to install a new mailbox. If you know anything about me, you know I’m not the handiest person. I don’t fix things. I don’t install things. There’s a reason I rent our apartment and can easily submit work orders (which reminds me … our tub has been clogged for a few weeks …) as opposed ot fixing things myself. Still, it was fun! I basically watched my dad do the whole thing and then helped him put the new mailbox on, but of course that’s more than I typically do. Then, I watched my dad plant. I didn’t feel like getting dirty but I was a great supervisor! 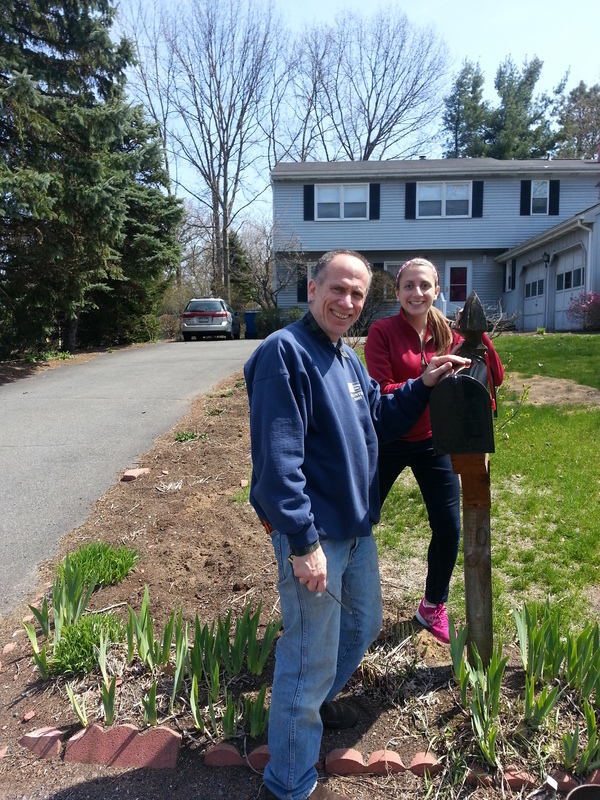 Yes, I’m doing handy work … I helped my dad install a mailbox! After relaxing outside on our deck all afternoon and dozing off for a little, my mom and I went to Saturday afternoon Mass. I haven’t been to Mass with my mom in a while, and it’s something i definitely miss. Then, we decided to go to Saratoga to walk around in the nice weather and grab dinner. We ended up going to one of my favorite casual places in downtown, Ravenous, for delicious fries and crepes. We left with clean plates … but of course after walking around a little managed to make some room for frozen yogurt. I gobbled up mine (vanilla, cake batter and coconut with too many toppings to count) before thinking of snapping a photo. After dinner, we watched The Life of Pi. Confession – I haven’t read the book, but I thought the movie was good, although somewhat sad at times and I may still be slightly confused at the ending. Sunday morning, I slept in and then decided to go for a run. My parents did their 6 mile walk, so after my run, I decided to run to meet them. I ended up running 7ish miles and then walking about 1.5 mi with them, which put me over my 20+ mile goal for the week and put me at ease knowing I wouldn’t be able to run on Monday before work (I had to get up at 3 a.m. just to make my flight). After my run/walk, it was time for some more homemade vegetable soup, cookies, and then of course, more baking! My mom, knowing how much I love to bake asked if I could make some blondies for her to freeze. Of course I happily obliged … and then spent the rest of the afternoon relaxing outside. How I spent most of the weekend … outside! For dinner, my mom made an awesome quinoa, cauliflower, chickpea salad, to go with the salmon and asparagus my dad had cooked. I love my parents’ cooking and miss it on a nearly daily basis! For dessert we enjoyed some of my blondies, plus ice cream. Monday morning meant getting up at 3:30 a.m. – not to work out, but to catch an earlier-than-should-be legal flight back to Cleveland. I hope I wasn’t too grumpy (little sleep+no workout=grumpy Melissa) at work, but I will be bringing in some cookies this week to bribe my coworkers just in case. All in all, a great, relaxing weekend at home. This weekend should be a busy one filled with a few activities with B’s family (his cousin’s first communion and party, plus his brother and sister-in-law’s annual Kentucky Derby Party), so I’m glad I got some time in with my family. Hope everyone has a great week! What’s your favorite dessert combination? (I love cookies and ice cream. Or white chocolate and peanut butter and pretzels. Or white chocolate and ice cream. Or anything with ice cream. What’s the earliest you’ve had to get up for a flight? Did you get outside and enjoy the warm temps this weekend? B was out of town for a few days, and of course, I got a craving for some baking. I had plans to visit my parents and bake when I was seeing them, but I knew that trying a new recipe, including one that involved something potentially messy like caramel and melted peanut butter, in my parents’ kitchen, may not be the best idea. But one in my kitchen – when B wasn’t home? Perfect! OH em gee. These cookies are SO good. They’re super sweet, super sinful and super rich — you HAVE to make these. Good luck not eating the whole pan! Preheat the oven to 350 degrees F. Grease (or use cooking spray) a 9×13-inch baking dish. In a large bowl, combine flour, oats, sugar, baking soda and butter. Mix it well until the texture is crumbly. Divide batter in half. Press half into the bottom of the pan and bake this crust layer at 350 degrees for oven for 10 minutes. While batter is baking, prepare the caramel layer. 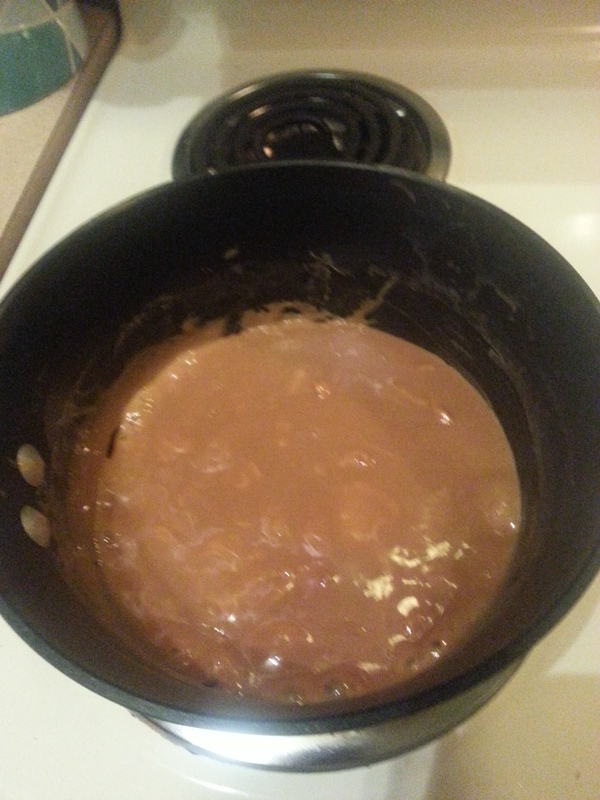 In a medium saucepan, combine the caramel candy and milk over low heat. Stir well as the caramels melt and caramel is thick and smooth. When cooked, remove crust from oven and sprinkle chocolate chips evenly over the top. Don’t turn off the oven yet! Pour the melted caramel evenly over the chocolate and top with the remaining flour-oat crumbly batter. Warm up peanut butter in microwave. Drizzle peanut butter over flour-oat crumble. Bake for 15 minutes at 350 degrees. Cool before cutting into bars. Enjoy!!! cut into bars when cool .. and enjoy! I always forget about snickerdoodles. When it comes time to baking, and baking cookies in general, they are typically the last cookie to cross my mind. Why? I don’t know, but they are often the neglected cookie in my life. That’s why, when I tagged a few blondie recipes to share with B and he suggested I make the snickerdoodle ones, I got excited to try them out. And I’m glad I did – they came out soft, chewy, and SO GOOD. Almost like a coffee cake. YUM! Another keeper. Preheat the oven to 350 degrees F. Lightly grease a 9×13-inch baking pan. Combine flour, baking powder, salt, cinnamon and nutmeg in a medium bowl and set aside. Beat the butter and brown sugar on medium speed until light and fluffy. Add the eggs and vanilla and beat until completely combined. Turn the speed down and gradually add the flour mixture until just combined. Combine the sugar and cinnamon and sprinkle evenly over top of the batter. Bake for 25-30 minutes until toothpick inserted into batter comes out clean. Cool before cutting. Enjoy! These are great right out of the oven (and somewhat mushy) and even a day or so later (more cakelike). Store in an airtight container at room temperature. I woke up today with an email alert from my alma mater, Boston College, telling me that campus was closed and students were urged not to leave their dorm rooms as the whole city was on lock down. Just when I thought the madness was starting to end and city was starting to heal, additional deaths were reported and the remaining suspect was still at large. It’s been a rough week. I also learned that one of my classmates’/and one of B’s suitemates’ brothers was seriously injured, along with his wife, in the week’s attacks. We’ve donated to their medical expenses, I wore blue and gold twice this week AND I’ve vowed to run at least 26 miles this week in honor of all those affected – but still, what else can we do besides sit back, watch, hope for the best, and stay positive? It’s hard feeling helpless … but I’ve started to realize that what we CAN do is stay together and show our support. From wherever you are. I’m so proud that even in Cleveland, we’re doing what we can. That’s why I hope you’ll join local runners tomorrow morning for Silent Saturday. Running together to show our support. This Saturday , April 20th we will be running in Downtown Cleveland – to mourn those lost, those hurt, and show our support for everyone affected by the tragedy in Boston. I’m not quite sure how many will be there. This isn’t a race, this isn’t an “official” event – it’s just a way to show support, together. 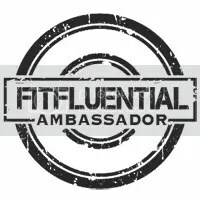 Please spread the word to runners and running clubs in the Cleveland area. Please join us. Before the run, I am hoping that we can share a brief moment of silence – maybe pray, maybe reflect – just take a minute or so of silence to take everything in together before we head out. There are two suggested routes on the website (3 and 6 miles)and I don’t yet know if I’ll be in attendance, but if not, I’ll be thinking of all those affected and staying positive as I think of all the survivors and the kindness and generosity that is being shown during these difficult times. So, to those in Boston, please know that this New Yorker, living in Cleveland, is thinking of you. April is Donate Life Month and this Friday is Donate Life’s National Blue and Green Day. It’s a day for people to wear blue and green, to show their support and raise awareness for organ, eye and tissue donation. Not only will I be wearing blue and green, but I also decided to bake some blue and green cookies in honor of the day (and maybe bribe/thank some coworkers who show their support). I had quite a few blue and green themed-recipes in mind – mostly more cookie balls/truffles (I even have green candy shell that I wanted to use) but B kindly suggested that I make “real cookies.” SO, I pulled out this recipe for monster cookies that I had saved a while ago, added blue and green M&Ms and Blue and Green Day Monster Cookies were born! This recipe could easily be modified to show support for your favorite cause, or sports team – just swap out the M&M colors! Combine the flour, baking soda, and salt in a small bowl and set aside. In a stand mixer, cream together the butter and sugars. Beat in the peanut butter, vanilla, and egg until smooth. Add in flour mixture and stir until just combined. 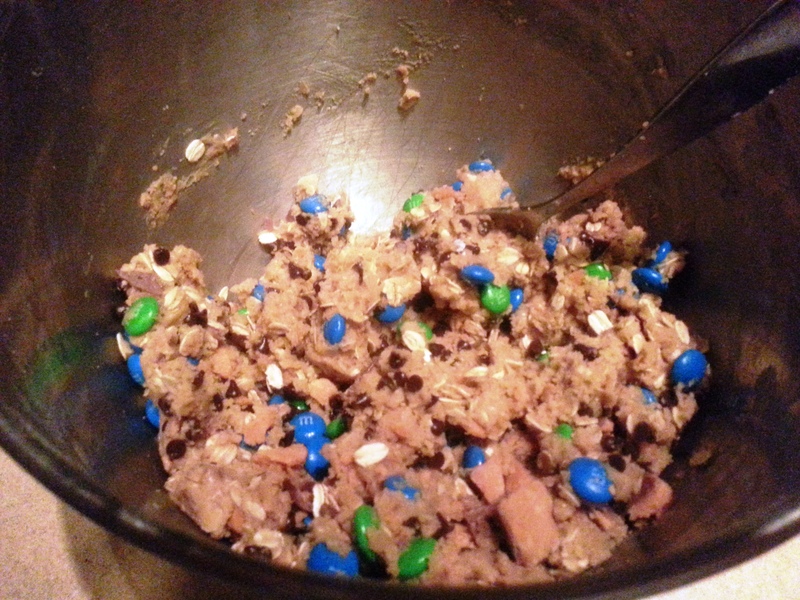 Mix in the oats, chips, M&Ms and Butterfingers evenly distributed. Drop rounded spoonfuls on to greased cookie sheets. I spray mine down with Pam first. Bake for 10 minutes in the 350-degree oven, until the edges start to brown. Cool on cookie sheets for 2-3 minutes before transferring to wire cooling racks to cool completely. Here’s what it all looks like mixed up. Yum! Disclosure: Donate Life Ohio is one of my clients. 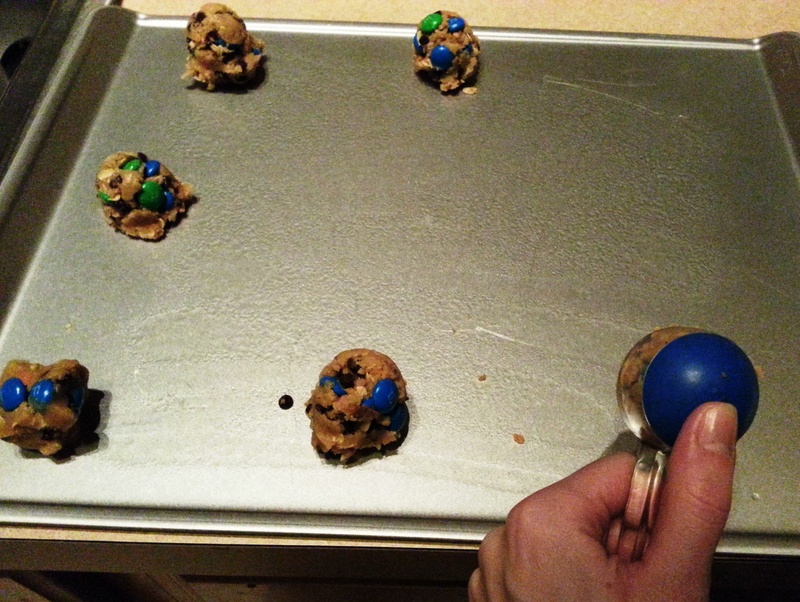 I was not asked to make blue and green cookies or blog about Blue and Green day. Still, donation is an issue that is important to me and I’m happy to use my blog to remind people the importance of registering as a donor. Currently, nearly 120,000 men, women and children are awaiting organ transplants in the United States. To register as a donor, visit http://donatelife.net/register-now/, or in Ohio click here. I’m speechless. I can’t stop thinking about the sadness … and madness … from today’s Boston Marathon. As a former Boston resident, I mourn for the injured and for the dead and cannot stop thinking about the feelings sweeping the city on this normally joyous occasion. I think about all my fellow Bostonians, who were spectators and runners on what should have been a beautiful day. As a runner, I mourn for the injured and for the dead and cannot stop thinking about those who devoted months, and years, to training and have not yet got to realize their dreams of crossing the finish line and running Boston. As a family member of runners (not racing in Boston this year), I mourn for the injured and for the dead and cannot stop thinking about those who spent months supporting their spouse/sister/brother/mother/father train and looked forward to cheering them on today, but instead were forced to send frantic texts as they waited to hear of their loved ones’ whereabouts. Thinking of all those affected by this tragedy and keeping everyone in my prayers. My next run will be a grateful one and I will certainly be thinking of all of you. Phew! WHAT a week it’s been. I was in town all week, which usually means a pretty easy/carefree week, but for some reason it was crazy! I’m so happy it’s Friday and am looking forward to the weekend. Friday after work B and I will be joining some friends for drinks, and then going out to dinner. I cannot WAIT for a glass of wine, some conversation and dinner out! 2. Indians Game – Social Suite! Saturday, B and I are heading to the Indians Social Suite to watch the Indians take on the Chicago White Sox. It will be my first official game of the season and with weather calling for temps in the 40s, I’m glad we’ll be watching from the warmth of a suite! Plus, I can’t wait to meet a few of my fellow suite members, including a few people I follow on Twitter but haven’t met in real life. Don’t laugh – it’s me and Slider at the Indians Home Opener back in the day – at the original Social Deck! B and I are service chairs of our local BC alumni group chapter. One of the things we do each year is plan and organize our chapter’s Alumni Day of Service Event – which is this weekend! For the past few years, we’ve worked with Moriah House, with the West Side Catholic Center, cooking and serving breakfast. I will be up a little earlier than I typically am on Saturdays, but it’s so worth it. 4. More Cleveland International Film Festival Action! B and I somehow ended up with 4 more tickets to the film festival – and I couldn’t be happier! We have two full days now to get some more movies in. My recap of the first films we saw is here. Any suggestions on what to see next? 5. DOING ANYTHING I WANT. Maybe it’s going to the West Side Market again for fresh produce. Maybe it’s going for a long run outside on Sunday, or checking out my much neglected (on my behalf) fitness membership. Maybe (well hopefully because I have a huge urge) it’s baking. Maybe it’s FINALLY finishing Gone Girl and paying my $2 overdue library charge! Maybe it’s all of the above. Because despite having some things already planned, and some work and non-related items I need to cross off my to-do list, I am SO ready for the weekend! my fave produce stand at the market. B and I typically buy 90% of everything we need for the week there.